When it came time for director John Carpenter and producer Debra Hill to create a follow-up to their classic 1978 fright movie Halloween, proclaimed by producer Hill as “the most success indie in history until Blair Witch,” the two took their inspiration from an ethereal pulsating fog they observed while visiting Stonehenge in England. The result was 1980’s The Fog, and though it met with only moderate success, the film’s craftsmanship and ultimate cult status certainly warrants its reincarnation in Shout! Factory’s handsome new Blu-ray and DVD editions. Shout! Factory’s releases are led by a handsome high-def transfer of the film supervised by cinematographer Dean Cundy, who’s also on-hand for a new retrospective interview about his many collaborations with Carpenter, which include Halloween, Escape From New York and The Thing. In addition to all the bonus features that appeared on MGM’s 2002 special edition DVD of the film (a Carpenter/Hill commentary, three featurettes, outtakes, storyboards and trailers), Shout! Factory has outfitted their discs with a handful of new bonus features, including a lively commentary by stars Adrienne Barbeau and Tom Atkins and production designer Tommy Lee Wallace. 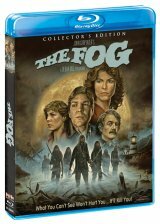 Best of the bunch is a 22-minute interview with star Jamie Lee Curtis (You Again), who acknowledges The Fog’s quality while admitting she’s not a big fan of it. A chatty Curtis also offers that she’s grateful to Carpenter for jump-starting her career with Halloween, which led to leading roles in such subsequent horror films as Prom Night and Terror Train. She also mentions that she didn’t ask for the “Scream Queen” title that was thrust upon her in the 1980s, but she didn’t have much of a problem with it — particularly a few years later when starring roles in Trading Places and other major non-horror projects started to come her way.